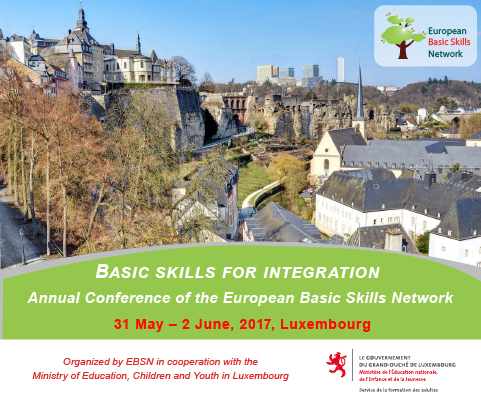 We are happy to inform you that the preliminary program of the Annual Conference of the European Basic Skills Network to be organised in Luxembourg on 31 May – 2 June 2017 is now available on the EBSN website. This year the conference is organised in cooperation with the Ministry of Education, Children and Youth in Luxembourg, Department of Adult Education. This event is organised as part of the national program for the implementation of the European Agenda for Adult Learning in Luxembourg. The title of this year’s conference is Basic Skills for Integration. We are planning to have keynote speakers from the host country and from the European Commission; we are going to hear about integration and the Upskilling Pathways, and have a discussion on how EBSN contributes to the implementation; as usual we are going to have carousel presentations and a roundtable discussion on good examples of basic skills policy and integration. Detailed information on registration will be available in the middle of March. The Second Chance school of Tours (Loire valley, France) welcomes young adults (from 18 to 30 years old), without any diploma and who left the education system for more than a year. The aim of this school is the construction of a professional project, the acquisition of basic skills or finding qualifying training. It focuses on a sustainable entry into employment. What do all the sad events which took place in 2016 have to do with adult education? Of course, not everything is connected to adult education. There are economic and political parameters that we as adult educators cannot influence. But there are some issues that deserve to be looked at through an adult education point of view. In her blog post Gina Ebner looks back on 2016, a year, which at least in the (social) media is described as a horrible year. Benefits of adult learning: we know how to build effective "upskilling pathways"! Andrew McCoshan reflects on how the adult learning sector can help in the response to the call from the Council of the EU to develop pathways for adults with poor basic skills. Adult learning professionals will have a lot to offer in the coming months as EU Member States start to develop the upskilling pathways called for in the recent Recommendation from the Council of the EU. They have a wealth of knowledge and experience that will be invaluable for the planning, design and implementation of the pathways needed. Between April 2016 and February 2017, the first trainers were trained in Austria to deliver basic skills training in the workplace. This took place within the context of the project ‘T ABA’ or ‘Training of trainers for basic skills training in the workplace’, which was financed with support from the European Social Fund (ESF) and the Austrian Federal Ministry of Education and carried out by the BFI vocational training institute. The Institute for the Public Service in Malta will be organising Basic ICT Skills for Complete Beginners. This introductory course is ideal for those who have no experience with computers. This course will cover the basics of using a computer including basic use of Word, Excel, Email and Internet. At the end of this course participants will sit for a short test to demonstrate the learning achieved. If they successfully pass the test, a certificate of achievement will be awarded. NALA - Making it go further is a new research report that provides a series of numeracy case studies and resources. This report is part of a series of case studies and action-learning projects that describe a range of literacy and numeracy practices and programmes across Ireland. This research takes place in the policy context of the Further Education and Training Strategy (FET) 2014-2019. The FET Strategy, which aims to develop a high quality integrated system of further education and training in Ireland, includes a literacy and numeracy strategy with twelve elements that prioritises numeracy as an area of strategic importance. On the link you can find a list of free reasources as well. The Spanish Association of Reading and Writing (AELE) is organising the 20th European Conference on Literacy and Sixth Iberoamerican Forum on Literacy and Learning. Both events will be held in Madrid (Spain) from 3 to 6 July, 2017. The Conference motto is "Working together to encourage equity through literacy communities: a challenge of the 21st century". Weaving literacy through lifelong learning Report on the day seminar held on Friday, 18th November 2016. Literacy practitioners, researchers and students from NGOs and higher education institutes with an interest in literacy in development came together for this engaging and interactive seminar organised by the British Association for Literacy in Development (BALID). It was organised with assistance and support from the UNESCO Institute for Lifelong Learning (UIL), the UCL Institute of Education Post-14 Centre, and the British Association for International and Comparative Education (BAICE), who funded six bursary places at the event. The report gives an overview of the discussions from the seminar.